Each month when Food & Wine magazine comes I eagerly flip through the pages and dog-ear all the recipes I want to make. Do I ever make them? Rarely. Not that I don’t want to. I never seem to find the time to get through the ever-growing stack of recipes I want to try. And then a month comes and goes and a new issue of Food & Wine arrives and I repeat the process. And then there was Cornmeal Almond cake. 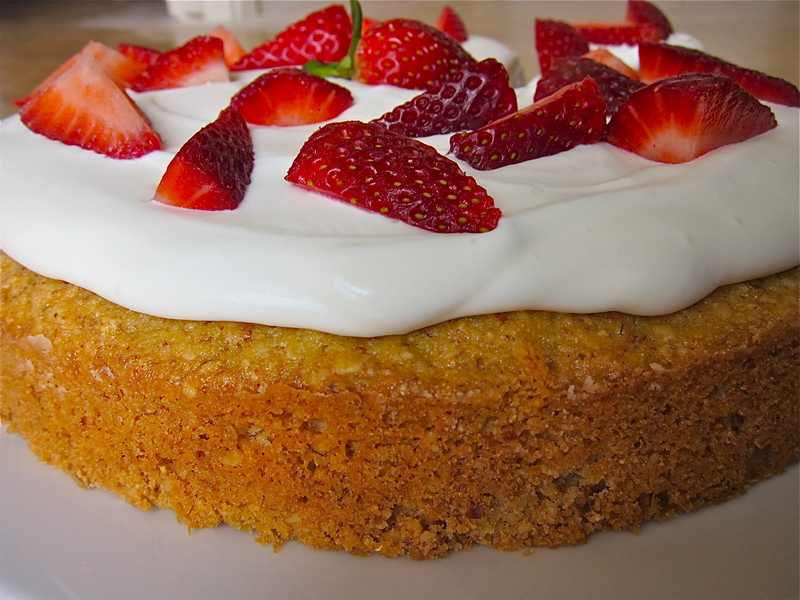 In the March issue of Food & Wine there is a lovely recipe for Cornmeal Almond Cake with Strawberries and Mascarpone. The picture made me drool and after reading the description I knew I had to make this cake. So I rushed to the store to gather my ingredients and begin baking. This recipe calls for 3 cups of almonds! I’m an almond lover so this was super exciting and intriguing. What would all these almonds – toasted and finely ground – do to the texture of the cake? I needed to know. The cake took no time to make. After baking In the oven for 45 minutes, the cake is ready to cool and be slathered with a mascarpone whipped cream. Can we take a second to talk about mascarpone whipped cream? Why isn’t all whipped cream made with mascarpone? Why? The resulting whipped cream is extra smooth with a subtle tang. It is incredible. And the cake. Oh the cake. Buttery, nutty, with great texture and crumble. All those almonds exude amazing flavor into the batter and create a great texture for each bite. 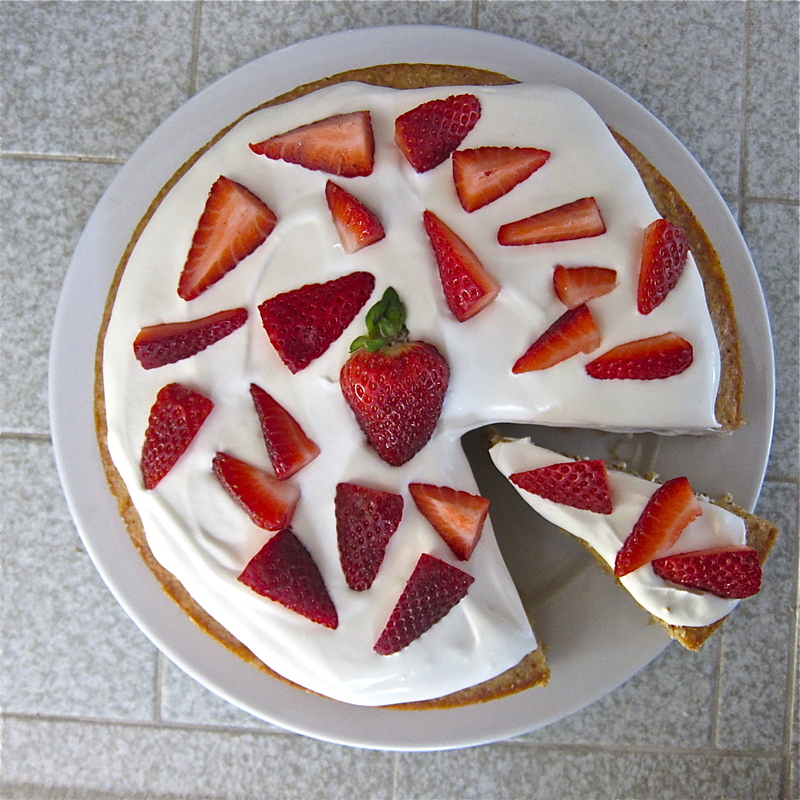 The mascarpone brings together the crumbly cake and the sweet strawberries adding a nice silky finish. 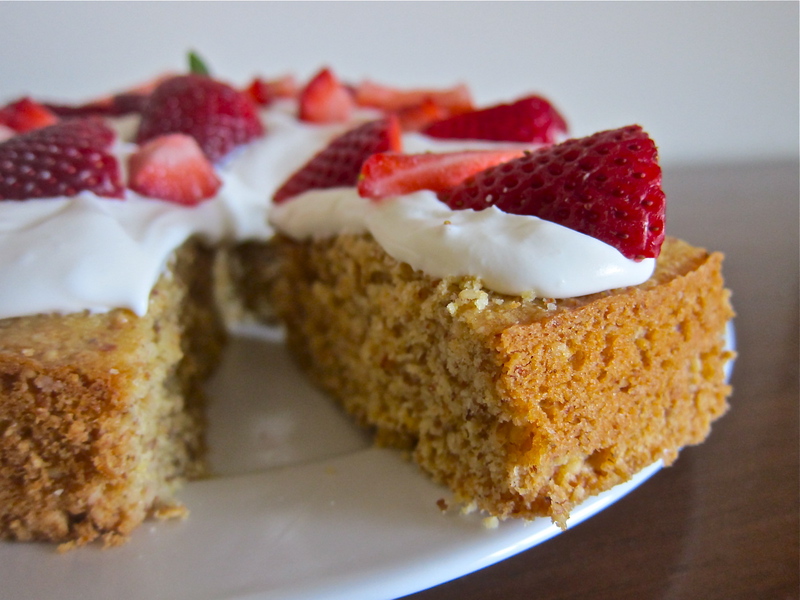 The cornmeal is really a background player – this cake is all about the almonds. Preheat the oven to 350°. Butter and flour a 9-inch round cake pan. Spread the almonds on a large rimmed baking sheet and bake for 5 minutes, stirring once, until golden. Let cool completely, then transfer the almonds to a food processor and process until finely ground but not pasty. In a medium bowl, sift together the flour, baking powder and salt. In a large bowl, using an electric mixer at medium speed, beat the butter with the sugar and vanilla, scraping down the bowl, until light and fluffy, 2 minutes. Beat in the eggs, 1 at time, beating well between additions. Scrape down the bowl and beat the batter until fluffy, 1 minute. Beat in the lemon zest and juice. With a rubber spatula, fold the flour mixture into the batter, then the cornmeal and the ground almonds. Scrape the batter into the prepared pan and bake for about 45 minutes, until a cake tester inserted in the center comes out with a few moist crumbs attached. Transfer the cake to a wire rack, still in the pan, and let cool to room temperature. In a large stainless steel bowl, using an electric mixer, whip the cream to soft peaks. Add the mascarpone and confectioners’ sugar and whip until barely firm peaks form. Your opening photo is so sharp and clear…I want to reach thru my screen and GRAB a berry right off the top! Thanks Averie! it was hard not to eat the whole cake it one sitting! Elliot – your Mom would love this! I think we should be neighbors. Then we could share all of the delightful things that come out of our ovens! This one looks so good! This looks really good and I’m excited to give it a try! Cathy- I wish we were neighbors the bounty of goodies would be endless!